Avoiding possible EMC issues at the design stage minimizes the potential need for costly rework in the later stages of vehicle development when prototypes become available and ensures that brand value and market share are not damaged by adverse publicity. 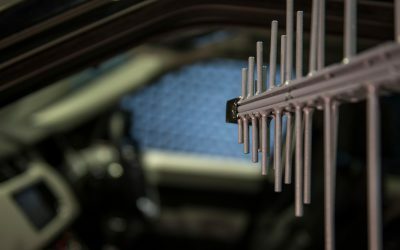 Furthermore, our Electromagnetic Resilience services provide engineers with the means to use this information in vehicle EMC design. The electrical properties and geometry of vehicle structures have a profound effect on the coupling of electromagnetic fields to and from vehicle electronic equipment. A logical first step is therefore to use simulation to assess the likely impact of the vehicle structure on its EMC performance characteristics and to predict the impact of possible mitigation strategies in order to minimize the risk of EMC issues at the design stage. Some automotive application examples are outlined below. The partial cavities of the vehicle interior can exhibit significant resonance effects. 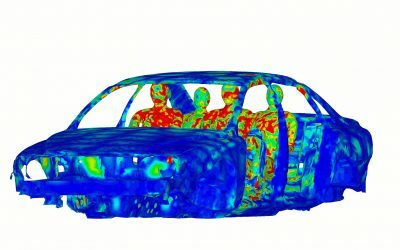 Simulation of the frequency dependent spatial field distributions within the vehicle structure under external illumination conditions can allow more realistic sub-system immunity requirements to be identified. This can ensure that sub-system immunity requirements are sufficient but not over-engineered, and indicates where non-compliances may be tolerable, thus minimizing development risks and costs. Where there is location flexibility, simulation data can also be used to objectively rank the options. High-voltage traction batteries are physically large and complex systems, which are integrated with low-voltage networks that provide supporting monitoring and control functions. The latest edition of CISPR 25 recommends limits on the RF coupling between the high- and low-voltage power networks. This parameter can be simulated (depending on the details of the implementation), allowing quantification of the coupling and investigation of possible mitigation strategies at the design stage. Furthermore, the RF impedance presented by the battery may also be predicted from such simulations, which could then be used in models for conducted emission propagation in the HV power network. In addition, high-voltage traction batteries are potential sources of low frequency magnetic field exposure for the vehicle occupants. Information concerning wiring harness paths, construction, termination impedances and module noise sources could be used with vehicle models to estimate emission levels outside the vehicle. Predictions of this nature could be used to identify potential emissions risks during development, and to assess the likely impact of non-compliance with module conducted emission specifications. Simulation of the coupling from these sources to on-board radio antennas is also possible. Such models could also be used to estimate voltage and current levels induced at the harness terminals by off-board and/or on- board sources. This data could be used to further refine module level conducted immunity requirements. Calculated coupling between cables in the vehicle wiring harness can also be used to assess possible intra-vehicle EMC risks, such as cross-talk between cables carrying different types of signal. The use of models allows potential solutions to be evaluated at the design stage, when changes are simpler and less costly to implement. Other possible applications could include assessing signal integrity and resonance issues (e.g. in data busses), and supporting the development of test methods to assess harness performance and quality.